Marc Meltzer, Tyler Parsons, Grace Yoon and Sarah Pierce competed in the season’s penultimate meet last weekend. The cross country season culminates with the Meet Of Champions held at the challenging Holmdel Park, which has hosted this event since 1976. This meet features the best-of-the-best runners in the state. To qualify for the MOC, a team must finish in the top three and an individual must be in the top ten in their group state final, which takes only the top five teams from group sectionals. 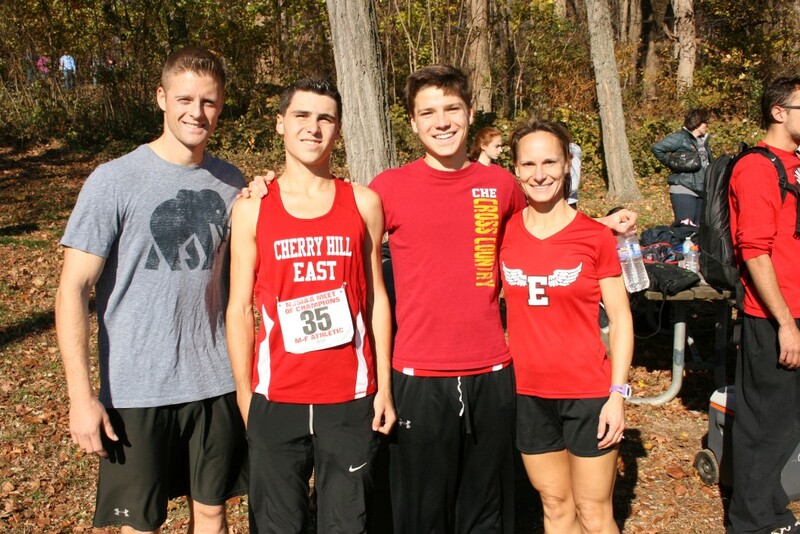 This year Cherry Hill East had four runners qualify for the MOC. From the boys team, seniors Marc Meltzer and Tyler Parsons qualified, and from the girls team the qualifiers were freshman Grace Yoon and sophomore Sarah Pierce. In addition, all four were recently selected to the All-South Jersey Team by the South Jersey Track Coaches Association. Meltzer (31st, 16:35) has run in the MOC every year of his high school career. Parsons (71st, 17:03) was running in his second MOC. The boys state champion is Elliot Gindi of Ocean Township (15:45). And the MOC team champion is Princeton, which ended Christian Brothers Academy’s six-year reign. In the girls championship, which featured 186 runners, Yoon (21st, 19:27) was the second highest freshman finisher. Pierce (22nd, 19:33) was the seventh highest sophomore finisher. Their times were the fifth and sixth fastest ever by a Cherry Hill East girl in the MOC, and their finishing places were the third and fourth best ever, behind only Theresa Cattuna who finished fourth in her senior year (2006) and ninth in her junior year, and just ahead of Missy Showers 23rd place finish in 2007. The state champion is junior Alyssa Aldridge of Mainland who won by 40 seconds in a time of 17:55, which is the seventh fastest time ever run by a female runner. The team champion was Group IV champion Ridge High School. The top four teams in the MOC were all from Group IV, which included South Jersey teams Kingsway (third) and Shawnee (fourth). In the state Group IV Finals the boys team finished sixth in a field of twenty teams and just missed qualifying for the MOC as one of three wildcard teams. Cherry Hill East has now made it to the state finals for nine straight years, which is tied with Southern Regional High School as the longest active streak. Cherry Hill East was led by seniors Parsons (15th, 16:35), Meltzer (20th, 16:45), Josh Dillon (21st, 16:47), Michael Onu (46th, 17:08), Zach Sell (18:17) and Noah Preihs (18:18). The only non-senior was sophomore Kyle Krell (17:39). Parsons’ time was the seventh fastest ever by a Cherry Hill East runner. Meltzer finish (20th) and Dillon’s (21st) are now the ninth and tenth best finishes. While Krell’s time is ranked as the sixth fastest ever by a Cherry Hill East sophomore in the state Group Finals. The girls team finished 12th and ran in their first state Group IV Final since 2013 and only their second in the last eight years. While the boys team is led by a strong senior class, the girls team is led by their underclassmen. Yoon had the best state final time and finish ever by a Cherry Hill East female when she finished second in a time of 18:28. Pierce was next (13th, 19:24) whose time is now the fourth fastest at Cherry Hill East. Also pointing for the Cougars were sophomore Dani Lazarus (21:19), senior Alexa Happ (21:22) and junior Greer Field (21:38). Also competing for varsity were seniors Taegan Field (21:47) and Rachel Allen (24:16). Lazarus’ time is the fourth fastest ever by a Cherry Hill East sophomore. Happ’s time is the tenth fastest ever by a senior. And Greer Field’s time is the tenth fastest by a junior.